The degrees of hearing loss refers to the severity of the hearing loss. Some people classify hearing loss as a percentage, which is not accurate. An individual cannot have 50% hearing loss or 70% hearing loss, because hearing loss can be different across frequency ranges. Classifying hearing loss on a percentage basis is an inaccurate way to label hearing loss and makes it difficult for the person with hearing loss to understand their audiogram. Normal hearing, mild hearing loss, moderate hearing loss, moderately severe hearing loss, severe hearing loss, and profound hearing loss. People with mild hearing loss have difficulty hearing soft consonant sounds making words seem incomplete. 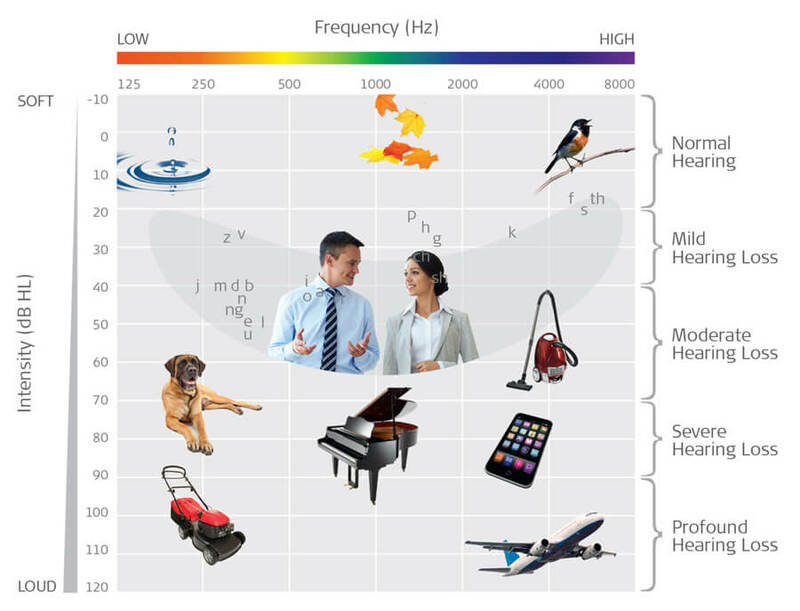 Noisy environments make hearing more challenging. 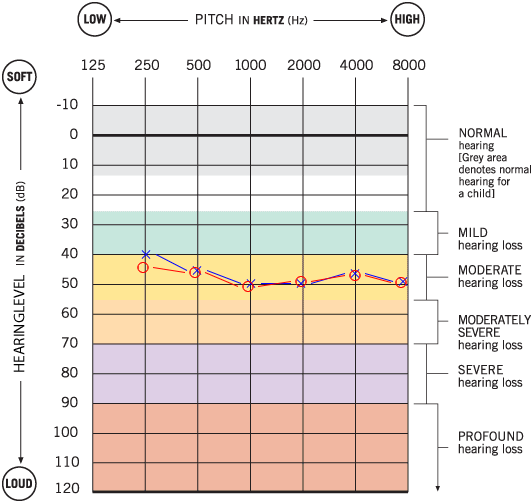 This is an example of what an audiogram might look like for someone with a mild hearing loss. People who suffer from moderate hearing loss usually have difficulty following conversations if they do not use hearing aids. Without amplification, the ability to understand conversational speech at a distance of more than 3 to 5 feet is very limited. An individual with moderate hearing loss will need to ask people to repeat themselves during in-person conversations and conversations on the phone. Most people moderate hearing loss, who don’t use hearing aids, become good at “faking it” when conversing with others. Often times, these same individuals withdraw themselves from social situations due to difficulty following conversations. This is an example of what an audiogram might look like for someone with a moderate hearing loss. People who suffer from severe hearing loss, following a conversation without a hearing aid is nearly impossible. Conversations have to be conducted loudly and group conversations require a lot of effort and are very tiring on the brain. Individuals with a severe hearing loss, who do not use hearing aids, are at a higher risk for developing dementia. This could occur due to depression, auditory deprivation, and cognitive decline. This is an example of what an audiogram might look like for someone with a severe hearing loss. Individuals with profound hearing loss cannot hear other people speaking unless they are extremely loud. Without a hearing aid, a person with profound hearing loss cannot understand speech. A lot of people with profound hearing loss are cochlear implant candidates. Most individuals with a profound hearing loss, who do not use hearing aids, are at a higher risk for developing dementia. This could occur due to depression, auditory deprivation, and cognitive decline. This is an example of what an audiogram might look like for someone with a profound hearing loss.